Charming holiday house is situated in a peaceful part of Selište Drežničko, in a country side, 4 km from National Park Plitvice Lakes. Two floor cozy holiday house with 2 bedrooms, 1 bathroom, a large living room, with a charming fireplace and fully equiped kitchen to salon, surrounded by a large garden. The garden and exterior porch are beautiful and very comfortable. It has also a outdoor furniture as well as a barbecue. All guests also can use 4 bicycles for free. "Bedroom 1" has one single bed for two person (160x200), and "Bredroom 2 Gallery" is located on the open gallery, and has a two single bed (90x200) for two person. National Park Una in Bihać is 24 km from D.I.M. Holiday House.. It is well connected with main cities by motorway, It is 136km from Zadar airport and 141km from Zagreb airport. The description was accurate. It is a lovely place with own Garden and very quiet surrounding. We enjoyed the stay very much. The Equipment is fine and the House very clean. The parking spot is in front of the house. The Housekeeper lives next door and is very kind. Messaging with owner was straightforward and the response time very short. Perfect spot for exploring the Plitvicer see. The House ist suitable to stay with 1-2 Kids, own play equipment available in the Garden. Several good restaurants and markets are near. We absolutely recommend this House and are looking forward to stay there again. Thanks a lot! Great apartment. Well equipped. Great garden for children and beautiful surroundings. This one is a winner. Don't hesitate to book. We enjoyed our stay in this lovely little corner of Croatia. The house and property were well kept and our hosts were kind and even gifted us with homemade honey and wine! We recommend the Holiday House highly! 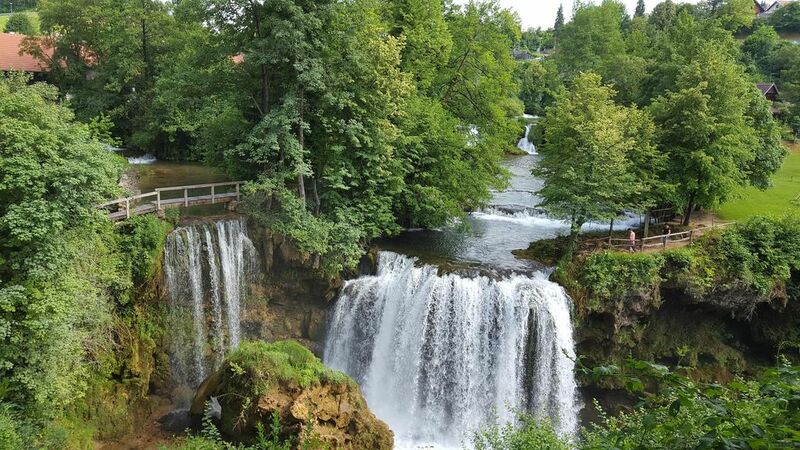 Wonderful place to enjoy Plitvice. Wish we had stayed longer! The setting was beautiful and the house was built with such attention to detail. The kitchen has everything you need so enjoyed cooking our meals in. The best part is the owners parents live next door and were there to greet us and make us feel at home through our entire stay. A wonderful place for a coupl or family. The property was beautiful! The home was clean and newly renovated but still had all the charm of a country weekend house. Location was great, we spent one day hiking the parks and another exploring a few of the smaller villages that are close by. Local restaurants were very good, and a bottle of wine on the porch to top off the day made it the perfect getaway home. The hosts were helpful and polite the whole way through, this one is a gem! A great escape from the the city! Fantastic house. Gret location for Plitvice. The house had every facility we wanted and was super clean. Very relaxing to return to after the crowds at Plitvice Lakes. The owner was helpful and communicative when we were late to arrive. The housekeeper next door was wonderful and made sure we had everything we needed.